LOS ANGELES, California, May 23, 2012 (ENS) – Los Angeles City Council today voted to adopt a ban on plastic bags at retail checkouts, making the ” City of Angels” the largest in the country to phase out the single-use bags. The City Council voted 13 to 1 to phase out plastic bags; Councilman Bernard Parks cast the single no vote. The ban will be phased in during the next 10 to 16 months at about 7,500 stores. First there will be a four-month environmental review of the ban, followed by passage of an ordinance requiring that retailers stop giving out the carryout bags. Then, larger stores would have six months to phase out plastic bags and smaller markets would have a 12-month phase-out period. Council members declined to also ban the use of paper grocery bags. An estimated 2.3 billion single-use plastic bags are given out in Los Angeles each year and the shoppers that have relied on them will have to learn to carry reusable bags for their purchases. The mayor says their needs will be taken into account. “We will make sure that both retailers and shoppers have ample time to adjust and adapt before any permanent changes take effect, while moving us forward towards a cleaner, plastic bag-free city,” he said. The vote adds Los Angeles to the list of 47 other California cities and counties that have banned plastic bags, which create unsightly litter, clog landfills and storm drains and pose a threat to wildlife and the environment. Nonprofit groups have been campaigning for the ban. 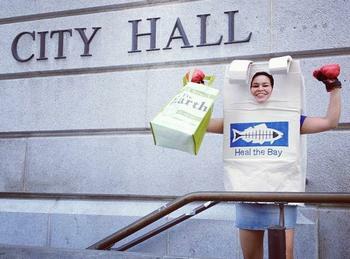 Environment California is joined by Heal The Bay, Plastic Pollution Coalition, Environmental Media Association and others in a letter sent to Council urging a yes vote and a rally in front of City Hall just before the vote today. Many film, TV and music stars supported the ban, including: Julia Roberts, Jeff Bridges, Amy Smart, Kyra Sedgwick, Julia Louis-Dreyfus, Ted Danson, Rosario Dawson, John Cusack, Peter Fonda, Jackson Browne, Bonnie Raitt, Linda Ronstadt, Ed Begley Jr. and many more. Analyses by city staff and others have determined that single use bags cost Los Angeles consumers and taxpayers more than $75 million annually in higher grocery costs and pollution clean-up costs. Plastic bags have been found to be one of the largest and costliest contributors to litter and pollution in the Los Angeles River and Ballona Creek. Under Clean Water Act, city tax/rate payers have been forced to spend an estimated $10 million annually to clean up and keep plastic bags out of these impaired water bodies. Los Angeles has tried recycling plastic bags at curbside, but Murray says that effort has proven to be costly and unsuccessful. “Despite previous promises from the plastics industry, financial support and end-use markets for plastic bags collected at curbside have failed to materialize. The costs and contamination imposed in the city’s curbside program by plastic bags far exceed any environmental benefit,” he said. Environment California, which advocates for clean air, water and open spaces across the state, says single-use plastic bags have gone from a public nuisance to an environmental crisis. “Designed to be used for only minutes, plastic bags never degrade and last hundreds of years in the ocean. Plastic pollution can kill wildlife that mistake it for food or become entangled in it,” says Environment California, pointing out that over the past 25 years, plastic bags have been one of the top items collected on International Coastal Cleanup Day.